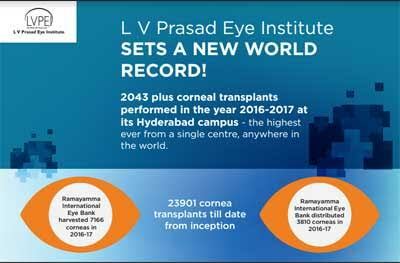 Hyderabad : The L V Prasad Eye Institute (LVPEI) has created history once again in the field of Corneal Transplantation with its Hyderabad campus becoming the first ever in the world to perform 2043 corneal transplants in a single year (April 2016 – March 2017). This is a record for the highest ever corneal transplant surgeries from a single centre, anywhere in the world. Since its inception, the institute’s Hyderabad campus has notched up over 23,901 corneal transplant surgeries thus far. The Ramayamma International Eye Bank at the campus harvested a whopping 7166 corneas this financial year, and distributed 3810 corneas to corneal surgeons across the country. Corneal disease is a major cause of blindness in India. Of the 10 million blind in India, 1.1 million are blind in both eyes due to corneal disease, injury or infection. An estimated 80 per cent of blindness globally could either be prevented or treated. The dedicated Ophthalmic Cornea Institute at LVPEI the Tej Kohli Cornea Institute has enabled the team to invest in research of new materials and application techniques to eliminate corneal blindness. Corneal transplantation is the only known cure for corneal blindness, which is made possible by the donation of healthy corneas by individuals upon their death. Over the past 27 years, LVPEI has worked greatly towards increasing the collection of transplant able donor corneas and elevating eye banking performance standards in India, as well as, other parts of Asia and the developing world. The institute’s expert cornea surgeons have been able to achieve exceptional outcomes of transplantation surgeries, thanks in large measure to the high standards of eye banking, besides their own world class training and expertise. Going forward, new research and cutting edge techniques at the institute are expected to augment transplant surgeries in using synthetic corneas, and reduce the conventional dependency on donor corneas. LVPEI has also been very active with stem cell based treatment of corneal diseases, besides research in bio synthetic cornea as well as liquid cornea. The Institute’s world-class Cornea specialists treat corneal infections using sophisticated laboratory techniques and medicines to prevent corneal scarring, and thus the need for future corneal transplantation. Congratulating his team on this major feat, Dr. Gullapalli N Rao Founder and Chair, L V Prasad Eye Institute said, “Organ donation is a major challenge in India, and to achieve this world record, while we are still creating awareness about eye donation, is even more commendable. This achievement should help raise the confidence that organ donation and transplantation in India can potentially touch record volumes, given a dedicated team approach and strategy.” The cornea team at LVPEI has contributed to the evolution of modern eye banking and specialized cornea care in India. “This is an ongoing process in our efforts to create more milestones in the coming years towards our mission of alleviating avoidable blindness in India and the world,” Dr Rao further added. 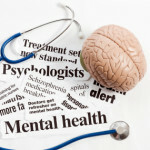 A whole gamut of specialized activities at the backend go into achieving the remarkable world record outcomes at LVPEI: (1) creating social awareness regarding eye donation through events and talks at educational institutes, organizations, residential townships, and engaging with the press and digital media; (2) initiatives such as the first Hospital Cornea Retrieval Program that involves counselors to be trained and placed in large multispecialty hospitals, which was first started at the Nizam’s Institute of Medical Sciences (NIMS), an initiative that has resulted in significantly higher yields of donor tissues; (3) fellowship training for ophthalmologists, and eye bank training programs for technicians, counselors and managers; (4) in-house manufacture of a cost effective, indigenous storage medium to preserve the harvested corneas that is supplied by LVPEI to all eye banks across India and the neighbouring countries; (5) cutting edge technology such as the Specular Microscope to evaluate donor tissue’s suitability for transplantation and the Asia-Pacific region’s first ‘Pre-cut’ tissue centre that reduces overall cost and improves quality of transplantations; (6) lobbying with policy makers to influence better standards of eye banking in India, publishing peer reviewed papers on outcomes and making international presentations.